Shown above: 1 Tessa Rope Club Chair, 1 Tessa Rope Loveseat, 1 Cosmo Side Table, 1 Kane Drum Side Table, 1 Blok Concrete Round Side Table Small, 1 Blok Concrete Round Side Table Large (other items shown are not included). 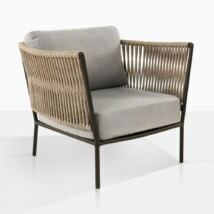 The Tessa Rope Outdoor Furniture collection is a spectacular new look in our beautiful portfolio. It’s unique and approachable, incredibly comfortable and very stylish. It’s everything you’re looking for in an outdoor furniture collection: deep comfortable seats, minimal maintenance, incredible looks, all-weather capable and a real head-turner. This collection includes the following pieces: A Loveseat (two-seat) and a relaxing chair. The collection is made of a gorgeous polypropylene rope that offers a medium/large diameter rope texture and look, which results in a rustic, but still contemporary look. The frame is made of powder-coated aluminum and the cushions are covered in Sunbrella® fabric. The Sunbrella® cushions are included as shown.